Mackay Road Runners club was formed in April 1976 by a group of keen runners. The original president was Dave Sedgmen and the secretary was Brian Feigert. The Club’s calendar featured races with a variety of distances from 3 kilometres to a Marathon which catered for all runners over marked courses. The program ran from February to October. As the group grew many of them would meet up for their training runs. Townsville and Rockhampton would often have runners compete and many of the runs became competitive between the towns. One of these competitions was a 24 hour run which was held at the Mackay Race track. The mile course was run by 10 runners from each town in relay for 24 hours. Each town had their day of victory but it was very always closely competed. Another original race was the Utah run which was a 28 kilometre put on by the Sarina Athletic Club and ran from Hay Point to Sarina township. This was a very hilly course with many road surfaces. It was very popular with runners throughout Queensland as many runners used it to gauge how they would go in the Gold Coast Marathon which was six to eight weeks later. With the aid of sponsorship Ron Grant entered in one of the Marathons and also conducted a coaching clinic which helped many of the runners. Shoes were a big debate in the early years as many of the runners were using KT 26s and Nike but were interested in finding out what shoes would suit each individual runner. It was trail and error but runners soon found what suited them best. Many of the members took part in races in all parts of Australia and were very successful. 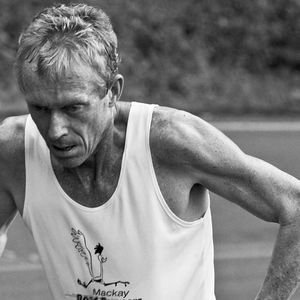 Merv Shields made the marathon his race and competed in the Oceania Games as well as many Australian titles. Charlie Martel made the mountain races through out Queensland look like molehills with his ability to scale them with speed. Ian Javes who was president for a few years competed in the Sydney to Melbourne Ultra with some of the Mackay Road Runners members acting as his support group. Ian is still involved with Ultra marathon running. As a club the members supported many charity runs and activities. One that is remembered is the relay run that was conducted for cancer research from Camooweal to Rockhampton via Townsville. This run had runners from Townsville, Mackay and Rockhampton and raised a large amount of money. Each runner ran 5 Kilometres in relay and the competition between each town again was keen with every runner trying to beat the time set by the previous runner.